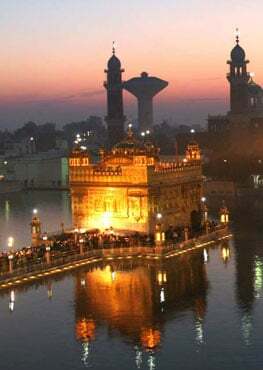 Waheguru Ji Ka Khalsa Waheguru Ji Ki Fateh. Hukamnama today is by Guru Arjan Dev Ji in Bilaaval Raag on Ang 811 of Sri Guru Granth Sahib Ji. Those who come to baasbai - abide with him; what does this mean? Does it mean you have to live with the Sadh Sagat? Sadh Sangat is the company of the holy, in the Guru’s presence, with the Sangat singing the praises of the Guru. It does not mean that you have to live permanently there, in the Gurdwara or the place of worship where the Sangat gets together. He talks about is baasbai, to dwell within, making that into your life – going there every day to be in Sangat, sitting with the Sangat, in the morning in the evening. And what is Sangat? satsangat kaisee jaani-eh jithey aiko naam vakhani-eh It is that place where there is true Sangat, true society, where we get together to meditate upon the name of the God, name of the Guru. So Guru is saying saaDhsangat kai baasbai - those who dwell in Sangat, who have made their life the Sangat, kalmal - all of their sins, sabh - means all, nasnaa - literally means to run away. What we can take it to mean in this case is that the sins are removed, taken away. Why? When we sit in the Sangat we chant upon Waheguru, we sing Kirtan, praises of Waheguru, praise of God and the sins inside get washed away. When we sit in the Sangat and listen to Katha, the translation of Gurbani, the meaning of Gurbani, we start to understand and look within ourselves to find true spiritual peace. Those who are raati=aa colored in the rang - color of love, parabh saytee – saytee means withparabh - with Waheguru, Lord, who are in love with God. taa tay garabh na garsanaa; garsanaa - literally means to be caught by, imprisoned by garabh - in the womb. They will not be put into the womb again. What does this mean? They won’t have to come through rebirth. They won’t have to come to the earth born again and again if they are in love. kahat - chanting, repeating the Naam - name of the govind - creator of the world, Waheguru, Lord God. soochee bha-ee rasnaa - Your rasna - your tongue; soochee - pure. That tongue is pure that sings praises of the Waheguru. Sadh Sangat Jio, Guru Ji is saying to purify yourself externally and internally. kar ishnaan simar parabh apna mann tann bha-eh aroga -get up in the morning, have a ishnan – cleanse your body, cleanse your mind with the Guru’s words. man tan - your mind and body, your spiritual mind and spiritual body arenirmal - purified by japnaa - meditating by chanting, by praising the jap the Banee, word, that Guru has given to you, the Gur Mantar that is given to you - Waheguru. Rahao Guru Ji says pause and think about this today. Those who have chaakhat - tasted the ras - the essence of Waheguru, Hari, God. What does this mean? Those who have through meditation started to receive this pleasure of meditating; not meditating because they have to but meditating out of their love, have the peace, that pleasure which they receive. Guru Ji says they becomeDharaapi-aa - all of your worldly desires are put out, completely satisfied. man ras lai hasnaa - your spiritual body takes that ras, takes that essence, that divine pleasure, joy and hasnaa - it literally means to laugh, here it means to enjoy, to be in divine ecstasy. What else happens when you are in this state of joy, buDh - true understanding, true intellect, spiritual wisdom - pargaas - literally means enlightening within, wisdom, pargat bha-ee - light and spiritual wisdom erupts within. ulat kamal bigsanaa, the lotus of my heart which was at one point attached to the world has ulat - has turned around. It has turned away from worldly pleasure to divinely pleasure. And bigsanaa - it is blossoming forth with the love of God. And what happens? You receive seetal - coolness of God’s word,saant - peace, harmony santokh - means contentment. sabh boojhee tarisnaa - Guru Ji says all - sabh of my tarisnaa - desires areboojhee - have been put out. My Dhaavat - wanderings in dah dis - all ten directions, wandering here and there, going to this and that, mit ga-ay - all of it has ended, has been put out. I don’t need to wander all around, I have found everything with Guru’s jap, with the Guru’s Mantar, with the Sadh Sangat. I don’t need to go anywhere, I have found Guru’s jap, the name of Guru on my lips. nirmal thaan basnaa Now I can dwell in that nirmal Thaan purifying place. Pure place is Sangat, that pure soul that I have found , that is where I want to dwell. Wht pure place? The turi-aa avastha - highest state of being. That state that is called barahm Gi-aan- wisdom of God. Waheguru raakhanhaarai has saved me raakhi-aa. He saved me, wasn’t through any deed of mine that I was saved, it was through his love. bha-ay bharam bhasnaa - bharam - my doubts have become bhasnaa - literally means burn away. All of my doubts and fears have burn away with his love. Satgur Arjan Dev Ji says I am sukhee - I am happy because I have the niDhaan - the treasure of Naam, God’s name. paykh saaDh darsanaa How did I receive this? When I had thedarsanaa - the blessed vision of the Sadh Sangat – the company of the Holy saints. Then I received the God’s name and God’s name blessed me with peace, happiness and joy.